Samsung’s Galaxy Note 8 packs a nice big 3,300 mAh battery, but heavy users still often have trouble making it through a full day without having to charge. What if we told you there’s an accessory that’ll make your Note 8 last as long as two or even three days in between charged? The ZeroLemon Ultra Power Galaxy Note 8 Battery Case packs in a massive 10,000 mAh battery, giving you a total of 13,300 mAh of power when the phone and case are both fully charged. There isn’t a soul on Earth who could eat through that all in one day, making this the perfect accessory for any heavy user who wants to finally feel comfortable leaving his or her Note 8 charger at home. 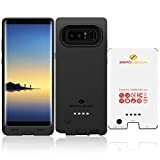 Extend 200% + Power to Galaxy Note 8 – The powerful 10000mAh Li-polymer extended battery can effectively provide 200%+ extra battery life to Galaxy Note 8, which is equivalent to add 96 + hours talk time, 32+ hour’s movie time or 148+ hour’s music time. Sync phone to Computer – File transfer technology supported. You can transfer data and file from your Note 8 to a computer without need to take the battery case off. Full Edge Protection – ZeroLemon Ultra Power with soft TPU case offers 360° protection, protecting your Galaxy Note 8 from scratches and other daily wears and tears. Intelligent Power Indicator – 4 LED colors indicate you the battery levels and charging status. Integrated button allows you to choose when to charge for when you need it most. Know before you go.